All-time low: -30%, last on Jun 22nd, 2018. 1st episode is FREE on Steam. Rating: Very Positive. CLICK HERE to trade with me! I’m giving the coupon out for free, of course. The Lion’s Song is set mostly in the prestigious “City of Music”, Vienna, during the early years of the 20th century. Throughout the first three episodes, the players are waltzed along streets filled with music, fanfare and the bohemian life while following the lives of three people: a struggling violinist, a budding artist and a strong-willed mathematician. (…) I have to say that The Lion’s Song and all of its chapters receive a solid and emphatic recommendation from me, especially if one is entangled in the world of the arts or seeking a tale that is told not only with silver-tongued phrases, but a tenderhearted tone. Current EA progress: solid game as is, looking forward to more content. Current EA updates: once a month minimum, estimated Sept 2018 release. I also have the Graveyard Keeper coupon, exact same thing. Let me know if anyone wants mine as well! @harith and I have a 10% off Guacamelee 2 valid until the 28th. Let us know if you want it! I also have the same coupon, for anyone interested. 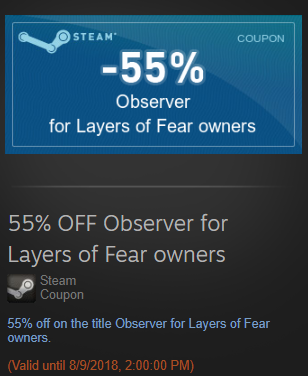 If any one is curious, the game is currently 10% off on Steam in its release week, and if you have the coupon, it stacks. So you end up getting another 10% of the remaining price, with the resultant game being 19% off total. It would be nice if they did that. But they always compound coupons and discounts this way… 10% from the coupon counts towards the remaining total after the Store discount. So 10% from store = 90%. 10% + 9% = 19% total discount. so 2 50% offs isn’t 100%, well dang it! This just popped into my inventory, no idea why. The expiration date is noon EST, so that’s Sept 26 at the same time as the Chrono deal refreshing. 66% off seems pretty good for this game, so if you want it, let me know, the timing listed is US Eastern Time. But you have a week to ask for it. I just got a new coupon that I’ll never use, but I’d say it’s a pretty good deal so I’d like to share it with you guys. 66% off Bryan Audley’s Numbers (spelt as Brayan Odleys Numbers on the coupon, though? ), which would make it $1.86 CAD. Good until November 19, 2018, which is 8 days away. When I saw this I was like, “hey that’s (that movie)” then I was like, “hey that’s pretty cool”…then I was like “hmm I think that can only be good as a movie”. Yeah, it seems that’s what a quite a few of the reviews think as well. So you get 35% with the sale, I see that @DanosaurJr and @Gnuffi have it on wishlist, so if any of you want it pm me. Same, I also got this. Any idea why?